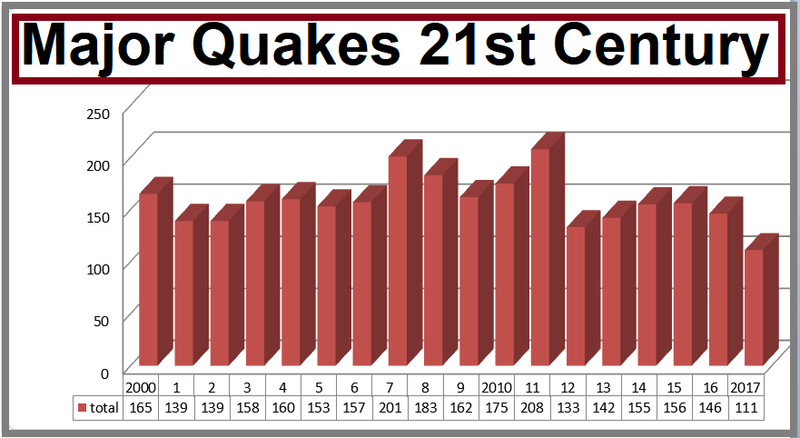 Major quakes (mag 6+) this century, Graph Gary Walton. It is a mystery that no one can answer why do major quakes just drop off the cliff? It is now 22 days since a mag 6.2 struck the Kermadec Islands north of New Zealand, since then nothing higher than 5+'ers. We have to go back to February this year when a mag 7.5 struck Papua New Guinea and back to January when the biggest quake so far this year a mag 7.9 struck Alaska, strangely enough, 3 mag 7+'ers were recorded in January and two in February then zilch no more since then. last year was the lowest yearly count for major quakes (mag 6 or higher) this century, actually, the lowest yearly count since the 1980's with only 111 major quakes recorded. With 110 recorded major quakes and a mag 6.3 thought to have been caused by a nuclear test in North Korea bringing the yearly total to 111 that figure was 50 down on this century's average of 161 per year. And after a strong start, this year is going the same way, halfway through the year only 43 major quakes have been recorded in 2018, 47 major quakes were recorded up to the end of June last year so it looks like we could be in for another record low year. With major quakes steadily rising since 1900 why the should suddenly begin to fall so dramatically since the beginning of 2018 is a mystery, if anyone out there has any ideas as for the drop please let me know!